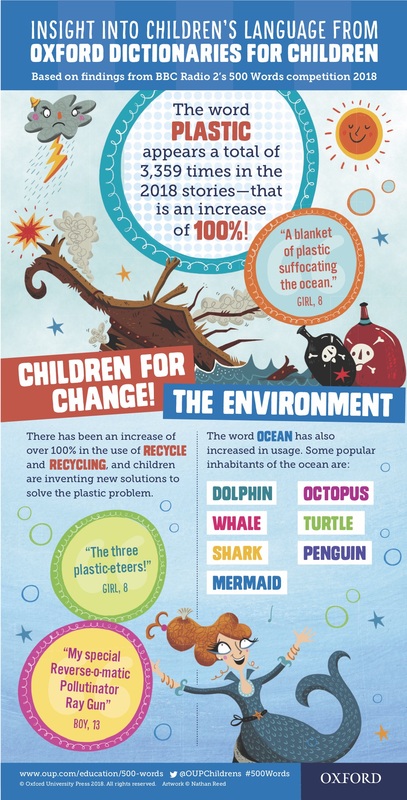 Nearly 135,000 stories from 5-13 year-olds across the UK and a huge 56 million words later, the Oxford Children’s Word of the Year has been identified as ‘plastic’. Oxford University Press have analysed all 134,780 stories submitted to BBC Radio 2 500 Words competition. They chose the word plastic because of its significant increase in usage this year and the emotive language the children used when writing about it and the damage it is causing our environment. The children’s stories on this topic are truly inspirational. The word cloud above (created by ReadOxford’s Yaling Hsiao) shows the words that co-occur with the word plastic in the children’s stories. The overall sentiment is clear: we are damaging the planet and children themselves are calling for this to end. Some stories are written from the perspective of a sea creature, another from the mind of a plastic bottle, aware that it’s doing damage. We see a lots of sea-related vocabulary including ocean, turquoise, calm, sparkling and salty. There’s also a range of creatures: whales, dolphins, sharks and mermaids. Tellingly, one of the most highly associated verbs with plastic is pollute. Some children offer solutions, including a ‘Reverse-o-matic Pollutinator Ray Gun’ and ‘The three pastic-eteers’ – a trio fighting the battle against plastic rubbish. Inspired by David Attenborough’s Blue Planet II and no doubt ensuing discussions in school, it’s impossible to read these stories and not be in awe of what children can do with language. They are using the power of words to inspire us, entertain us and bring our attention to the world from their eyes. And not just plastic — there are moving and instructive stories tapping news and politics, including Grenfell Tower, Syria, Korea, homelessness, terrorist attacks and school shootings. Our citizens of the future are also in touch with the past. Some stories draw on women in history, inspired by the recent celebrations of women’s emancipation. In one time-travelling story, our heroine Eve goes back in time to try to save Emily Davison from going under the king’s horse by attaching a selfie stick to Emily’s sash. Our young girls have their own aspirations for the future too, inspired by mentions of Amelia Earhart, Ada Lovelace and Marie Curie. Last year’s word of year Trump gets plenty of mentions this year too with some powerful associated vocabulary (bomb, attack, war, Mexico wall, destroy) as well as humorous descriptions involving hair and wig. 500 Words is a wonderful celebration of children’s writing. While it’s fabulous to see effective writing in action, it’s important to remember that some children find language difficult – they struggle to understand the meanings of words and how they work together in sentences. This has consequences for their learning and educational achievement – but also for active citizenship and having their voice heard. If children are to bring about change they need to learn to use language effectively to construct an argument that can persuade. To do this when speaking requires a whole host of cognitive and language skills, as highlighted in this discussion of the foundations of oracy. Writing brings further challenges. As discussed here, speech is typically ‘in the moment’ and listeners can benefit from all sorts of additional cues – tone of voice, gesture and facial expression for example. Written language can’t use these clues. Instead, the language itself has to do the work to reconstruct the images in the writer’s mind and take them into the mind of the reader. Many of the 500 Word entries show that young children have found their voice and can use it effectively to discuss issues that they care about – they do so with passion, with spirit and with joy. Children who find language difficult will need additional support at home and in the classroom to have their voice heard — whether speaking or writing. These children aren’t rare – teachers are concerned about the language gap and research by Courtenay Norbury and colleagues shows that the equivalent of two children in each Reception class of 30 have significant language concerns. Dorothy Bishop describes developmental language impairment as the most common developmental difficulty you’ve never heard of. And a recent blog by Pam Snow reminds us of the dire consequences that sometimes arise if language problems go unnoticed and unchecked. For now though, let’s applaud all the children who entered 500 Words this year (and the teachers and parents who supported them). It’s not just about the finalists and winners. Every story makes a difference. 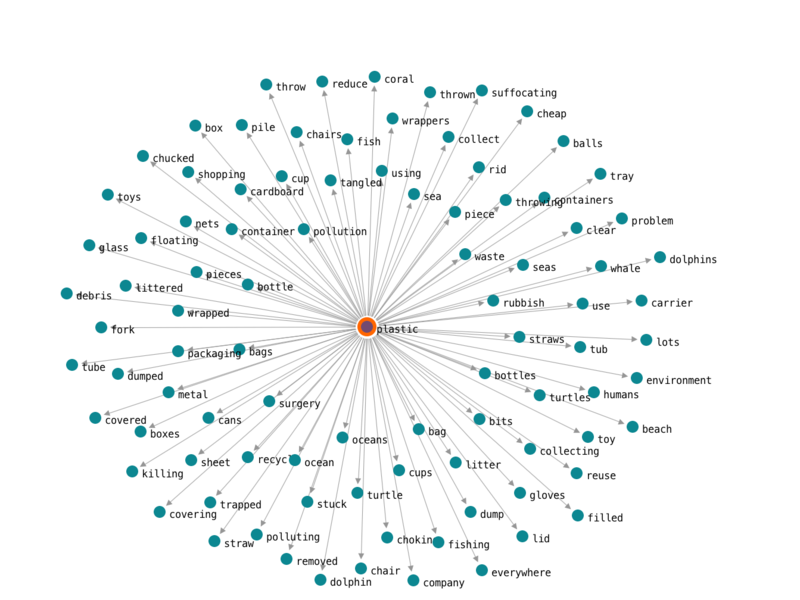 Every new story is now in the Oxford Children’s Corpus. This is helping us to understand language development and Oxford University Press to design language resources and dictionaries that can make a difference. Since the competition began, the corpus has grown to nearly 800,000 stories and an incredible 340 million words. Just awesome. OUP have produced a summary of their analyses and you can read and listen to the 50 finalist stories on the Radio 2 500 Words pages. The live final is on the Chris Evans breakfast show on Friday morning.